Each week during October, we invite you to Get to Know GMOs! So far, we have taken a deep dive into the basics of GMOs and explored the sustainable agricultural practices that most don’t attribute to GMOs. Now in week three we are tackling the topic of GMOs and pollinators, such as bees, butterflies and other beneficial bugs and insects. Pollinators, such as bees, are very important not only to agriculture, but also essential for biodiversity. Bees collect pollen and nectar to keep their hives alive, and this process happens to also pollinate plants. Pollination is a necessary part of some plants’ fertilization processes because it allows for the development of fruits and seeds. Honey bees are estimated to be worth $15 billion to the U.S. economy because of their role in pollinating agricultural crops. Several examples of the foods bees pollinate that are part of our food supply, include fruits, such as plums and apples, alfalfa, which is fed to cows which produce milk, nuts and so on. What might your morning meal look like without honey bees? Check this out. What’s going on? Colony Collapse Disorder (CCD). According to the U.S. Department of Agriculture, CCD is a “syndrome defined as a dead colony with no adult bees or dead bee bodies but with a live queen and usually honey and immature bees still present.” Since the Colony Collapse Disorder crisis in 2006, much attention has been focused on bee health, especially honey bee health. The scientific community agrees that CCD is a complicated issue, with no single cause. A variety of factors contribute to CCD, including parasites like Varroa mites, and lack of adequate nutrition. What’s the connection between honeybees and GMOs? Some GM crops express a trait for insect resistance, but the results of studies conducted on these plants indicate that they are not harmful to honey bees. Concerns have also been raised that a type of insecticide called neonicotinoids – or “neonics” – could be negatively impacting honey bee health. Sometimes the use of neonics are linked with GM crops, but neonics are used on both GMO and non-GM varieties of crops, like corn, soybeans and canola. Neonics are the most widely used class of insecticides and were adopted to replace more toxic organophosphates. They can be applied using a variety of methods, including soil applications or as seed treatments. When used as a soil application or seed treatment, neonics are taken up by the plant, but very little of the treatment makes its way into flowers and subsequently pollen. Research has been conducted to assess the role of neonics in the honeybee population. Amanda Zaluckyj from The Farmer’s Daughter USA blog explains that eight large-scale field studies have concluded there are little observable effects on honeybees from realistic exposure to neonics. Amanda’s blog goes on to explore how we know that neonics have not been shown to be a primary cause of honey bee population decline, and Dr. Stuart Smyth from the University of Saskatchewan, also covers this issue in his post, “What’s the Buzz on Bees?”. We understand there is concern about the health of the bee population. Bees are vital to agriculture and the environment and protecting their health is a shared responsibility among stakeholders. Therefore, while research indicates that neonics and GMOs are not causes of CCD, biotech companies are continuing to look at the science and conduct more studies to explore the role of agriculture in bee population health. The good news is that bee populations are currently at a 20 year high, but more can be done to strengthen growing pollinator communities. Many companies who participate in GMO Answers have provided the following information on how you can help protect the bee population. The Pollinator Partnership provides resources about how everyone – including farmers and ranchers – can help protect pollinators. Find information including a Learning Center, Eco-regional planting guides and more. Download the Bee Smart app, which shares information about pollinator gardens. Feed a Bee with Bayer, and join an online community of people growing bee-attracting plants using the hashtag #FeedABee. What’s going on? Monarch populations have been dwindling, which seems to be related to a few major causes: disruption of migratory patterns due to climate change; loss of overwintering grounds in Mexico due to deforestation; and reduced acreage of their summertime milkweed habitat, especially in the mid-western U.S.
What’s the connection between Monarch butterflies and GMOs? Milkweed is the primary source of food for Monarch caterpillars. However, it is also considered an agricultural weed in farm fields and in pastures, due to some species’ toxicity to livestock. The effectiveness of modern herbicides, including those used with herbicide resistant GM crops like glyphosate, is one of the many contributing factors to the decline of milkweed. However, milkweed density has also declined in non-agricultural areas over the same period, meaning the cause of milkweed decline is a more complex issue. Dr. Andrew Kniss, associate professor of weed ecology and management at the University of Wyoming, explains that “research does suggest that there are more important factors than herbicides responsible for the decline of native plant species near crop fields, including milkweeds.” He suggests that whatever is reducing milkweed in non-agricultural areas may also be contributing to the decline in agricultural fields, and seeks to unravel the real reasons for the decline in milkweeds in this post on GMOAnswers.com. Another contributor to the decline is that land use changes on publicly and privately managed lands, such as the construction of roadways, highways and electrical transmission lines rights-of-way – more than 26 million acres in total – have also contributed to the decline in available milkweed and other nectar plants. Roadside and public land management practices play a role, including frequent mowing or spraying of critical habitats along roadways, and the timing of these maintenance activities may negatively impact migration and breeding patterns. More states enacting Reduced Mowing Laws and better timing of roadside maintenance activities to allow for migration and breeding could help reinvigorate the necessary habitat and reestablish access to food sources for monarchs and other butterfly populations. Therefore, milkweed habitat decline is not solely a GM crop issue but also a product of land use change. But let’s get back to the balancing act of growing food, GMO or not, and preserving the monarch butterfly population. Farmers focus on using fields, and can’t efficiently grow food when plants are competing with weeds. The goal of an agricultural field is to produce crops, not weeds. Farmers make a living producing food – and weeds, such as milkweed, inhibit farmers’ ability to produce all crops. 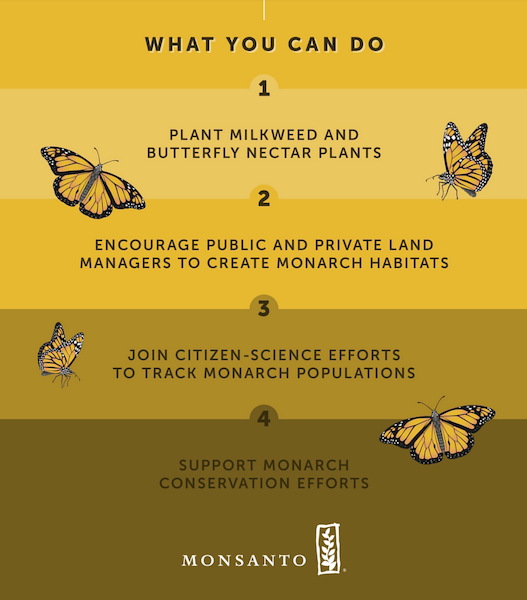 However, many farmers recognize the need to preserve milkweed and are establishing buffer zones or wildlife habitat areas to nurture milkweed and monarchs. Additional preservation efforts include growing milkweed in other locations outside of agricultural fields, like un-mowed roadsides, private gardens and other private and public areas…..
What’s going on? Bugs and worms greatly impact agricultural ecosystems, in both helpful and harmful ways. They can be beneficial, like ladybugs and earthworms, and help with pest management, building healthy soils and pollinating crops. Harmful insects are agricultural pests, which can devastate entire crops and cause economic or environmental havoc. Many agricultural pests are non-native species, such as the European Corn Borer. Farmers can implement crop management practices to manage for harmful pests, and maintain a healthy and balanced agricultural ecosystem. What’s the connection between balancing this ecosystem and GMOs? Insect resistant GM crops are utilized by farmers because of their ability to help control harmful pests more efficiently. These insect resistant crops incorporate one or more proteins from a common soil bacterium, bacillus thuringiensis (Bt) that kill target insects, like the corn borer, but not other non-target insects, mammals or humans. Claim #2: The use of Bt crops causes the Bt proteins to be less effective for pest control, and therefore require farmers to use additional pesticides. Safeguards are in place to help mitigate insect resistance, which are deployed on farms through insect resistance management, or IRM…. 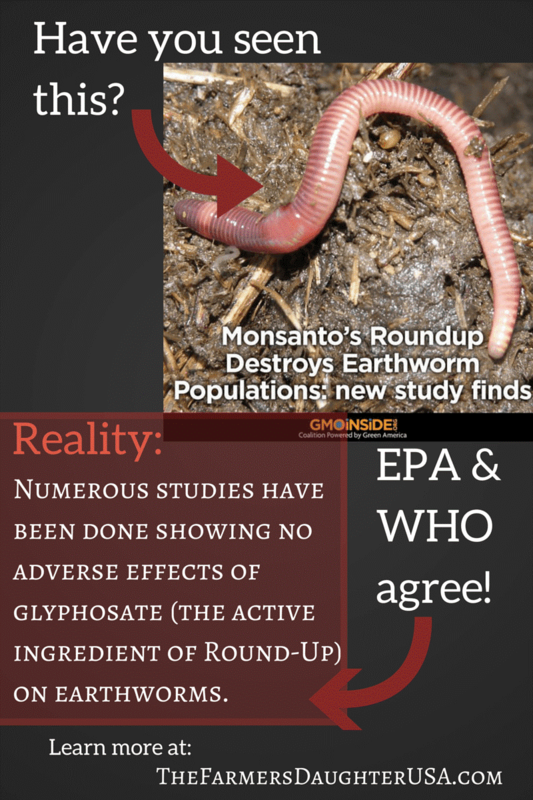 Claim #3: GM crops that are resistant to the herbicide glyphosate (the active ingredient in Roundup) harm earthworms because of the glyphosate applications. This claim has been debunked. Pollinators are vital to a healthy environment, including producing the food we eat, and the health of pollinators is a priority to everyone involved in agriculture. Many of the companies who participate in GMO Answers are working to provide solutions and best practices to help maintain the health and population of each species. We welcome your questions on what we’re doing to support pollinator health and populations, and invite you to join us in these efforts! Check back each week for more information to help you get to know GMOs throughout the month of October! Next week we will discuss the importance of the land, surface and soil for growing the food we eat. If you have additional questions, feel free to search our archives or submit a new question. GMO Answers was created to do a better job answering your questions — no matter what they are — about GMOs. The biotech industry stands 100 percent behind the health and safety of the GM crops on the market today, but we acknowledge that we haven’t done the best job communicating about them – what they are, how they are made, what the safety data says.